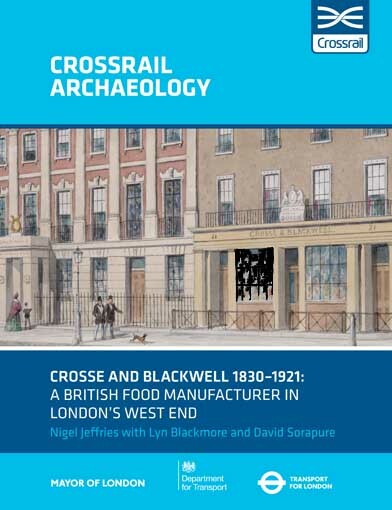 Excavation and building survey, related to the redevelopment of parts of Tottenham Court Road Underground Station by Crossrail Ltd, chart the history of food manufacturer Crosse and Blackwell in the Victorian and Edwardian periods until the 1922 move to Branston, Staffordshire. Operating from their 1838 premises in Soho Square, the company converted properties to the east for warehousing and factory space, enabling production of its food sauces, pickles, vinegar, jams and marmalades on a vast, industrial, scale. With a royal appointment and the innovative use of celebrity chefs, Crosse and Blackwell were able to dominate the domestic market and compete globally.